In early 2001, Miz Mooz was born as a private label brand and carried exclusively by a small chain of stores in New York and San Francisco. That didn't last long. The label was quickly grabbed up by specialty shops across the United States and Canada. Two years ago, the the little label that could was thrust on the national stage as the media started to include it in fashion mashups and shopping lists. But during the holidays, one of my friends assured me that the hook behind the shoes and boots is anything but hype. The hook is obvious. Miz Mooz makes high quality, affordable, and fun shoes by hand. These people — Cheryl Matson, Jeffery Bart, and Ron Kenigsberg — are serious about shoes. Every time they design a new pair, they like to talk about how its entire life will be an exciting one. It starts out as a concept in New York, improved upon by Italian shoemakers, and then is manufactured in Mexico or Asia. In other words, every pair circles the globe at least once, maybe twice. And, unlike most shoe manufacturers, every pair is not perfect. As handcrafted shoes, they are all a little different from the time they arrive to the time they are worn into the ground. The pair that initially caught my eye this weekend were Miz Mooz Marquis, the studded lace-up boot with distressed leather one-inch heels. 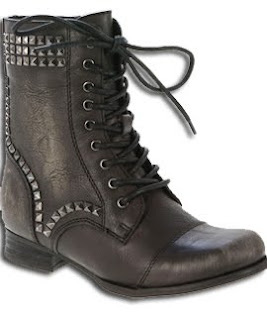 They are the kind of boot that almost asks for compliments in the form of a nod and whisper "cool boots." "Thanks," she smiled and shrugged. "Clearance." And that turned out to be true. Miz Mooz Marquis are clearly in the clearance column, which makes any review rather short-lived without a broader perspective. Miz Mooz makes for a perfect winter boot. One of the newest arrivals for the season was Sabrina, with the option to be worn as a mid-calf or ankle boot. It seems especially fitting for the East Coast, where fu- lined boots make more sense the than in the West. For the West Coast, you might take a look at the Miz Mooz Marsalis. It's not as striking as the Marquis, but still offers up that scuffed roughness that caught my attention in the first place. Miz Mooz Winter Boots, Tough Or Cute, Slips In At 6.9 On The Liquid Hip Richter Scale. Miz Mooz does for women's shoes and boots what Les Hommes does for men's winter high tops. There is an element of cool that helps you skip having to worry about quick changes in the car. They look good almost anywhere and gives guys a safer bet than trying to compliment a woman on her jewelry (which is often bought by some other guy). Miz Mooz Marquis and Sabrina are both available at Infinity Shoes. It's not uncommon to see them on the feet of musicians and actresses, but it's still not about popularity. It's all about handcrafted shoes, uniquely suited for people who expect more out of fashion. Special thanks to my friend Sandy, for letting me write about her boots. I can't wear them, but they still rock.